“Amazing Grace” from Christian Faith Publishing author Thomas Kruger (The Poet) is an assemblage of the author’s thoughts and emotions as he shares his journey to finding the Lord. “Amazing Grace” is the creation of published author, Thomas Kruger (The Poet), an eighty-year-old poet from Webster Lake. He is an avid fly fisherman and loves the great outdoors. He spends everyday with his beautiful wife at the Oaks Nursing Home where she resides due to a stroke several years ago. Published by Christian Faith Publishing, Thomas Kruger (The Poet)’s new book will take readers on a journey of one mans desire to become one with the Lord. The Poet will inspire readers word by word, verse by verse, as they continue to read through the pages of this poetic piece. The outstandingly well written book, “Amazing Grace” pulls the readers in with the raw emotion that is visible within each and every poem within the book. 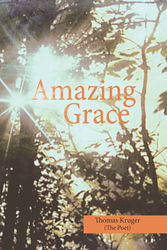 View a synopsis of “Amazing Grace” on YouTube. Consumers can pur c hase “Amazing Grace” at traditional brick & mortar bookstores, or online at Amazon.com, Apple iTunes store, or Barnes and Noble. For additional information or inquiries about “Amazing Grace”, contact the Christian Faith Publishing media department at 866-554-0919.